After nearly 24 hours of traveling, you should be exhausted. You’ve been in a taxi, two airplanes, and now a speedboat since leaving home. You’re in desperate need of a shower, a nap, and a drink—in no particular order. But as the boat glides across the sapphire water, passing little coral islands dotted with palm trees, a burst of energy awakens you. By the time the driver cuts the engine, that energy has turned into full-blown excitement. You see a long jetty and over-water bungalows ahead. White sand, more palm trees, and what looks like an enormous infinity pool is beyond them. A huge smile overtakes your tired face. The celebration has begun. 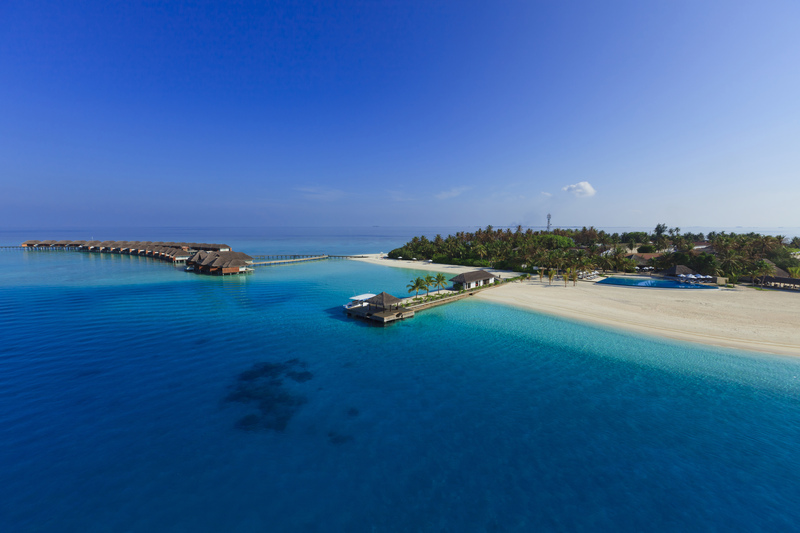 Many couples travel to the Maldives to celebrate honeymoons or big anniversaries. You’ve traveled to the island nation in the Indian Ocean to celebrate your birthday. With 26 atolls and nearly 1,200 coral islands, it feels like the perfect place to forget the number of times you’ve celebrated. A relaxing resort, the bluest water you’ve ever seen, and soft sand should help, as well. That relaxing resort is Velassaru Maldives. The private island is in the quiet South Malé Atoll, across the deep Vaadhu Kandu channel from its busier neighbor, the North Malé Atoll. Only three islands in the southern atoll are permanently inhabited. Velassaru Island isn’t one of them. That makes the island—your island—very secluded. You won’t be wanting for anything while you’re here, though. After being welcomed with a chilled drink and a cool towel, you’re escorted to your beach villa. When you started dreaming about this trip months ago, you pictured yourself in one of those over-water bungalows. With panoramic sea views, they’re gorgeous. But you fell in love with the spacious villa. There’s a plunge pool and a stone shower along the edge of the sand. Sun loungers, a wide umbrella, and a daybed are on the terrace above them. Another daybed, a wine chiller, and a comfortable bed facing the ocean is inside. 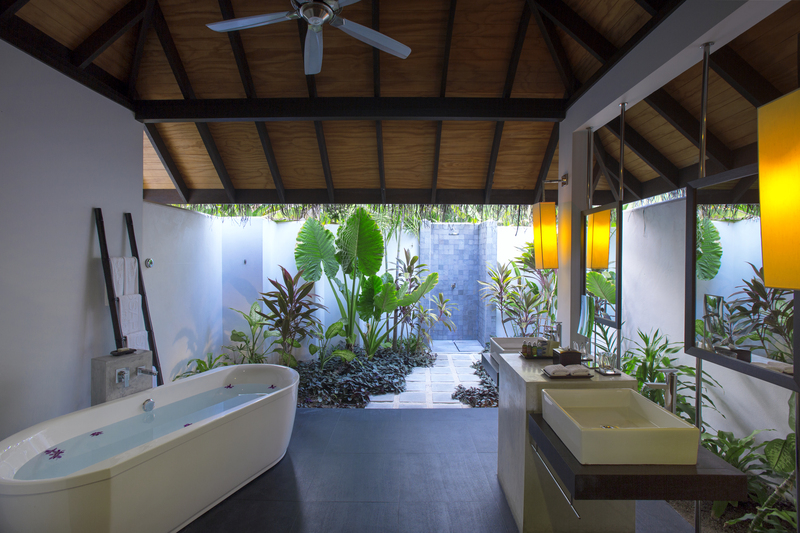 While an open-air bathroom, featuring a covered freestanding tub and an exposed garden with a larger stone shower, is in the back. You’re tempted to draw a bath or slip into the pool, but you’re afraid you’d fall asleep in the warm water right now. A massage in one of the spa’s over-water treatment rooms—with the water lapping below you—would probably lull you to sleep, as well. So you start by walking around the island. The whole trip takes less than 20 minutes, but it allows you to scope out the restaurants and the bars, the marine center and the water-sports center, the living gallery and the photography lounge. You make a mental note to join the morning cruise, the snorkel tour in the shallow lagoon along the house reef, and the sunset yoga class. Then, when you see bean bags spread out on the sand, you decide that it’s finally time to relax. Fen Bar is the perfect place to do so. Besides the overstuffed blue bean bags, there are knee-high white tables and hammocks strung between palm trees outside of the open-air bar. The menu features coconut-crusted prawns and tandoori chicken quesadillas. Ginger Flower Martinis and Grapefruit Negronis are on the long cocktail list. While the percussion-based background music sounds both familiar and exotic at the same time. You slip into a hammock, order a glass of Pinot Grigio and a cheese plate, and stare at the beautiful water. Now that your dream has come true, it no longer matters if you fall asleep. Happy birthday to you.